Aaron Rodgers was the best running back on the field. 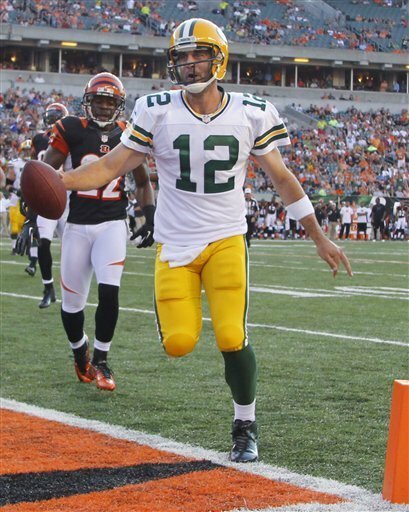 The MVP quarterback led Green Bay to a big first half Thursday night, running for 52 yards and two touchdowns during a 27-13 preseason victory over the Cincinnati Bengals, who simply couldn’t catch him. Rodgers avoided the rush and took off, finishing as the game’s top rusher. No surprise to Rodgers, who ran for three touchdowns last season while setting a club record with 45 touchdown passes. “I think I’ve showed it in the past,” Rodgers said. The Packers (No. 1 in the AP Pro32) wanted to look crisp coming off a drubbing by Cleveland. Rodgers led the way, going 12 of 22 for 154 yards with an interception while leading the Packers to 245 yards and a 17-6 halftime lead. He scrambled six times, scoring on runs of 12 and 5 yards. Rodgers made only one mistake, throwing an interception on a mix-up with a receiver. While Rodgers was the top runner on the field, Benson was the last to leave it. The former Bengal made his Packers debut and ran six times for 38 years. Benson led the Bengals (No. 14) in rushing each of the last four years, but they decided to let him leave as a free agent and signed BenJarvus Green-Ellis. Benson stuck around after the game and enjoyed his homecoming, meeting former teammates, coaches and acquaintances at midfield before jogging off long after everyone else had left. 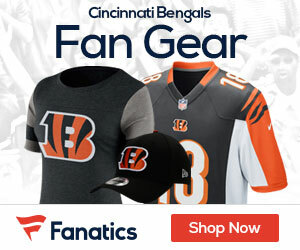 His Bengals jersey is on a clearance rack at Paul Brown Stadium’s gift shop. Benson signed with the Packers (1-2) on Aug. 14 and has been learning the play book, doing extra study time with the quarterbacks to pick things up. He got into a preseason game for the first time and gained 8 yards on a carry up the middle, receiving a mixed reaction from the crowd of 52,584. The Bengals (2-1) played their starters into the third quarter but they couldn’t get a touchdown, failing even on a first-and-goal from the 1-yard line. Andy Dalton played the entire first half and the opening series of the third quarter, going 5 of 17 for 40 yards and two sacks. He scrambled three times for 36 yards.